When your strategy means you are managing in an uncertain environment, this approach provides a useful guide to monitoring change, anticipating problems and knowing when to refine and update your strategy. It describes External Predictive Indicators that help you to monitor change during uncertain times. This paper introduces fourteen indicators for the economic climate. These fourteen indicators are used by smart organisations to avoid problems during the economic crisis and to prepare for recovery. It is a practical example of a small part of our Fourth Generation Balanced Scorecard approach. 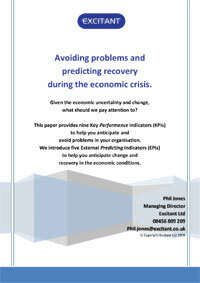 Five External Predicting Indicators (EPIs) to help you anticipate change and recovery in the economic conditions. You are probably familiar with KPIs: Key Performance Indicators. The nine organisational KPIs (Key Performance Indicators) have been chosen to help you monitor the health and performance of your organisation. The focus is on leading indicators, so you can anticipate problems when managing in an uncertain environment, so you can do something about them, before it is critical. If, say, a credit crisis is hurting badly, some will help you survive to fight another day. Some of these KPIs are chosen to help you stay in touch with your customers and to defend your competitive edge. These eight KPIs form a strategy map, which we provide in section 4. We use EPIs to refer to External Predicting Indicators. These monitor the external context, essential when you are managing in an uncertain environment. External Predicting Indicators look at the context and environment in which the organisation is operating. They are leading indicators of that environment changing: the signals that your strategy may need to change. “A crisis is a terrible thing to waste” We have provided five EPIs (External Predictive Indicators) to help you understand and exploit the economic situation. They will help you to anticipate problems and set your strategy in the right direction. They will help you unravel uncertainty, clear the fog, and anticipate changes. Using them you can avoid trouble and exploit opportunities. This involves a much wider perspective than the traditional view of KPIs and the Balanced Scorecard. Normally KPIs measure the performance of the organisation and the implementation of the organisation’s strategy. At Excitant we have found clients want, and need, to go further and wider. Our approach helps our clients to look at what underpins their strategy. We develop indicators that detect how the environment is changing and whether their strategic assumptions are still valid. We look at the context in which the organisation’s performance takes place, because this influences what is best to measure, how targets are set and whether those targets are achievable. This monitoring of the external environment is one of the features of our Fourth Generation Balanced Scorecard approach. Here are the 9 KPIs and 5 EPIs arranged in a Fourth Generation Balanced Scorecard’s Strategy Map.